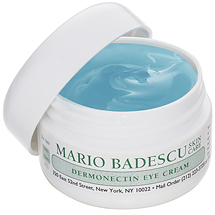 WHO: Dermonectin Eye Cream, for combination/dry and dry skin types. WHY: Dermonectin Eye Cream is an incredibly concentrated eye treatment designed specifically for very dry skin around the eyes. Azulene and Seaweed help soothe and nourish the delicate under-eye while a rich blend of Coconut, Peanut, and Vegetable Oils help provide intense hydration throughout the day. HOW: Pat a small amount of cream along the orbital bone from the innermost corner outwards, and take the excess over the lids and outward. Use twice daily for best results.